Green petroleum coke is obtained by decaying coke from the coker unit. When crude oil is converted into gasoline and jet fuels, green petroleum coke is obtained as a by-product. The quality of green petroleum coke depends on the quality of crude oil. The term ‘green’ refers to the stage of production process. The sulfur content in green petroleum coke decides the application of green petroleum coke. High sulfur content green petroleum coke is mainly used as a fuel in place of coal. Green petroleum coke with low sulfur content is upgraded through calcining and is used as a raw material for the production of aluminum and steel. The global green petroleum coke market is expected to expand at a significant rate driven by increase in demand from the cement industry. The green petroleum coke market was valued at about US$ 12 Bn in 2016 and is projected to expand at a CAGR of 6.1% during the forecast period. Factors such as strict government laws regarding carbon emissions, rise in demand for fabrication of aluminum smelter anodes, rise in prices of coal, and depletion of coal resources are driving demand for green petroleum coke. Strict government regulations that play a very important role in the green petroleum coke market. The environment is affected by toxins released through industrialization and emissions of harmful gases such as carbon dioxide, hydroxides, sulfur, and nitrogen from factories and vehicles. Green petroleum coke is highly stable and non-reactive to the ambient environment, as it has very low sulfur and ash content. It is an alternative energy source for coal that has high calorific value. Also, it poses less environmental hazards. 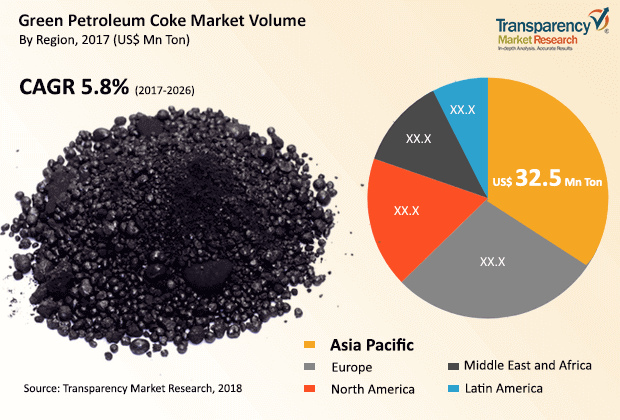 However, the presence of very few key players in the green petroleum coke market and fragmentation of the market are likely to hamper its expansion. Additionally, the market is so volatile that prices changes on weekly basis sometimes. Key players in the green petroleum coke market need to focus on the promotion of the benefits of green petroleum coke over coal. The use of green petroleum coke in ceramics and electronics industries can boost the green petroleum coke market. When green petroleum coke is mixed with additives such as binders and sealants, it offers excellent adhesion to the material. Major players in the market expand their network and share their investments through mergers and acquisitions. Launch of new products and facilities is likely to propel the green petroleum coke market. In May 2015, Asbury Carbons invested US$ 48 Mn in a new facility in Lumberton, North Carolina. The company decided to open the facility in North Carolina due to the state’s favorable access to rails and ports. In July 2014, Oxbow Corporation announced the acquisition of Carbon Resources LLC, a distributor and supplier of activated carbon products made from wood, coconut shells, and coal. Oxbow acquired the company to expand its footprint in the global activated carbon industry. In June 2015, the company initiated a six line expansion project, which is the largest project in the region. This project will enhance the smelter’s production with a capacity of 540,000 metric tons per year and will increase the production capacity up to 1.5 million metric tons per annum. This project will make the company the world largest single site aluminum smelter. Green petroleum coke is used in the form of sponge coke, shot coke, purge coke, needle coke, and honeycomb coke. Sponge coke is most widely used as a solid fuel to manufacture anodes in the aluminum industry. It is a porous coke produced by adding effective amounts of a carbonaceous material that contains oxygen. Purge coke is produced during the process of producing heat form coking reactions to convert vacuum residual into gasses, distillate liquids, and coke. This process is known as flexi coking. Needle coke is mainly produced from coal tar pitch or FCC decant oil. It is also known as acicular coke. It has high resemblance to the collection of vertical aligned needles. The properties of needle coke include a low puffing tendency, low coefficient of thermal expansion, and high mechanical strength. Needle coke is used for making graphite electrodes for electric arc furnaces. Shot coke has a high density. It is the abnormal form of delayed coke. It is hard, dense, nonporous, vitreous, and sphered shape. Shot coke is used to manufacture titanium dioxide, nuclear graphite, and graphite mold stocks. Honeycomb is an intermediate type of coke. It has elliptical pores that are uniformly distributed amongst each other. It is known as intermediate coke because it is neither as productive as needle coke nor is it like shot or sponge coke. This coke has lower electric conductivity and lower coefficient of thermal expansion as compared to needle coke . North America and Europe are the key regions of the green petroleum coke market. Asia Pacific holds a major share of the global green petroleum coke market, in terms of consumption, due to high demand in the construction sector, led by a rise in population. Middle East & Africa is an emerging region of the green petroleum coke market, due to high demand and fuel availability. The green petroleum coke market in India and China is expected to expand at a rapid pace during the forecast period, due to rise in industrialization and expansion in the construction industry in these countries. China is a major supplier of petroleum coke in Asia. Key players operating in the green petroleum coke market include Oxbow Corporation, AMINCO RESOURCES LLC., Asbury Carbons, Aluminium Bahrain (Alba), Atha Group, Carbograf Industrial S.A. de C.V., Rain Carbon Inc., Minmat Ferro Alloys Private Limited, Shandong KeYu Energy Co., Ltd. Weifang Lianxing New Material Technology Co., Ltd. Linyi Zhenhua Carbon Technology Co., Ltd. COCAN (HUBEI) GRAPHITE MILL INC. Modern Industrial Investment Holding Group. Sinoway Carbon Co., Ltd., and Ningxia Wanboda Carbons & Graphite Co., Ltd.